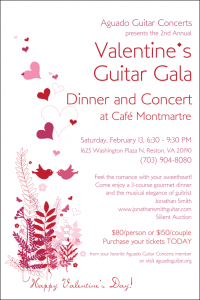 Join Aguado Guitar Concerts Saturday, February 13 from 6:30 to 9:30 p.m. at Café Montmartre in Reston, VA for a special Valentine’s dinner and concert! The evening will begin with a gourmet dinner in a romantic setting with live background music provided by AGC members, it will continue with a silent auction, and conclude with a concert of romantic music featuring the splendid classical guitarists, Jonathan Smith. The event includes dinner (your choice of one of three entrées), a silent auction, and a concert featuring guitarist Jonathan Smith. 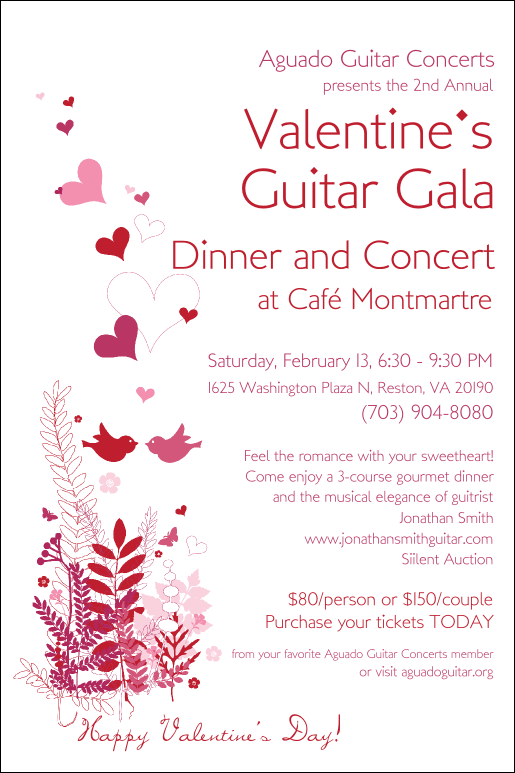 Tickets are $80/person and can be purchased by contacting Aguado Guitar Concerts by email or by calling Café Montmartre at 703-904-8080.